Due to time constraints, Kevin will NOT be building instruments at this time. A "fipple" pan flute or panpipes especially for playing Papageno's five note run in Mozart's, "The Magic Flute". This little five-tubed instrument makes sound with fipples, like a recorder. This is so a singer (Papageno) can quickly and easily play. 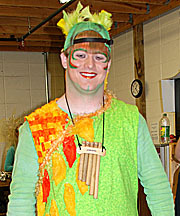 On the left is a photo of J. Cooper Schrimsher, who recently performed as Papageno using one of my panpipes. He writes, "Thank you so much for your hard work--they were amazing and the audience sure loved it!" Since you will be performing The Magic Flute, I thought you might consider an intriguing option. Commonly, when the Magic Flute is performed, Papageno mimes playing his pan flute, while a member of the orchestra, usually a flute or piccolo player plays the actual notes involved. Typically, this coordination, though a little awkward, is functional, if not entirely convincing. Over the past few years, I have supplied a unique alternative to a number of discerning companies, looking for something more authentic. Mozart wrote the part for a panpipe or panflute, and to fulfil that historically accurate intent, I make a version of the "Magic Flute" Papageno panpipe specifically for the opera in question. The Papageno panpipe has five tubes, and plays only the required G-A-B-C-D tones. What is more, it plays in tune! In this case, the tones are produced, not by blowing on open-ended pipes, (difficult for many) but rather by blowing over fipple-ended tubes, (as on a recorder). This method of tone production is easy for anyone, (with thirty seconds practice) and produces a clear focused sound. The instrument is made to be held easily in one hand, with holes drilled for attachment of decoration or a neck strap. Total length is about 10 inches, which makes it easily visible from the audience. The tubes are made of hard, carefully-chosen Chinese Bamboo, and electronically tuned. The cost is $150 U.S. which includes shipping by Air Mail in the US and Canada. Recently I have created such instruments for the Canadian Opera Company, in Toronto, and for the Opera in the Barn's "Magic Flute" in Durham, Ontario, the Domonton Opera Company, as well as sending two sets to the Austin Lyric Opera in Texas and the Monaco Opera. In the past, I have also created custom panpipes for a production of "Peter Pan" at the Shaw Festival in Niagara on the Lake. Two singers playing the role of Papageno have also purchased sets for themselves.